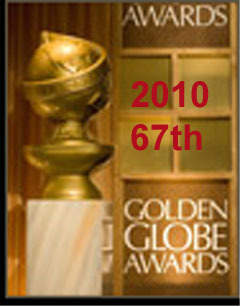 The 67th Golden Globe Awards will be broadcast tonight on NBC. There’s links to watch online if you aren’t by a TV. Here’s the complete list of nominees. Up in the Air scored a leading six nominations for the 67th Annual Golden Globes. Nine was next with five, followed by Avatar and Inglourious Basterds with four. On the TV side, newcomer Glee led all contenders with four nominations, followed by 30 Rock, Damages, Dexter and Big Love, with three apiece. The latest presenters list is here. The Red Carpet begins on E! at 3pm PT, 6pm ET. You can also follow E!’s Red Carpet on Twitter. Over at TV Guide Network, the red carpet also begins at 3pm PT and is being hosted by Chris Harrison (The Bachelor/ette) and Carrie Inaba (DWTS.) It will feature a 3-D Hologram Glam Cam . I loved Penelope Cruz’ dress and look. I also thought Kate Hudson and Nicole Kidman looked wonderful. As for the others, there weren’t a lot of “horribles” but there also weren’t many standouts. Though certainly not a fashionista, I know what works for me. I’d give my thumbs up for the night to Penelope Cruz and the double thumbs down to Jennifer Morrison.